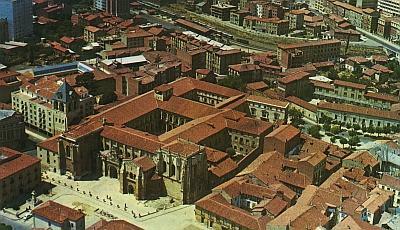 The Collegiate Church of San Isidoro in León (northern Spain) is doubtlessly one of the most important stations along the pilgrimage route to Santiago de Compostela. San Isidoro is famous because of the comprehensive architectural sculpture that pervades the structure both in the interior and exterior. Also the magnificently royal burial ground, the so-called Panteón de los reyes that borders directly on the church, impresses with its high-quality mural paintings and capitals. Due to the rich figurative architectural sculpture the complex of San Isidoro, constructed in 11th/12th centuries, counts as a key work for today's art historians. Today San Isidoro presents itself as a barrel-vaulted, triple nave basilica with cantilevered transept. The half-round middle apse of the choir section was replaced by a polygonal Gothic structure in the 16th century. San Isidoro can be traced back to a monastery church which was originally devoted to the saints San Pelayo and San Juan Bautista and which King Alfonso V (999-1028) had rebuilt from "clay and bricks" after its destruction by Almansur. In the course of the transfer of the bones of Saint Isidor (around 560-636), the famous church instructor of the western Gothic age, from Sevilla to León, Alfonso's daughter Sancha and her husband Fernando I had the edifice rebuilt in stone. At its consectration on December 21,1063, this building, based on the Asturian kings' edifices of the 9th century, obtained the patrocinium of San Isidoro. The church, called the Fernando church in research literature, was - according to excavation results - a triple-nave basilica without transept that ended with rectangular apses in the east, similar to the Asturian church San Salvador de Valdediós. Parts of its northern and western walls were integrated into the construction of San Isidoro, which is still conserved today. The Panteón de los reyes, representing an expansion in front of the western facade of the Fernando church, presumably dates to Urraca of Zamora († 1101), daughter of Sancha and Fernando. The Panteón de los reyes appears today as a nearly quadratic, two-story building that is subdivided into groined vault naves on the ground floor and spanned by a continuous vault on the upper floor. It is not sure whether the Panteón replaced a former building on the site. Today's church of San Isidoro resulted from several construction phases, the chronological order of which is still debated today. Contrary to the findings of older research literature, it can be assumed that the new building was not constructed in one go from one end to the other, but instead that the old Fernando church was adapted and reconstructed from different sides successively. This resulted in the cantilevered transept that was realised only at the end of the building campaign due to a change of plans. It is also a matter of debate whether the construction project can be ascribed to the successor and son of Fernando I, Alfonso VI (1065-1126, from 1072 King of Castile and León) or his sister Urraca of Zamora, who is the favored sponsor by the majority of researchers. The construction of the new church building of San Isidoro can be stated therefore only conditionally as dating to the 1070s, until its documented consecration in the year 1149. Since the dating of the sculpture of the outer building and the capitals inside the church is directly connected with the chronological progression of the building itself, the Leonesic edificial sculpture's historical importance rises and falls based on each particular researcher's opinion. This visualisation of San Isidoro's architectural sculpture aims to be a comprehensive presentation of the sculpture in the context of the church building itself and should be seen as fundamental research for future studies. Through the floor plan, the sheer plan and the tracings, single elements of the architectural sculpture (details of the portals' sculpture, capitals of the exterior and interior) can be accessed and seen in high-quality images and enlargements. In this simple manner, stilistic analyses of the architectural sculpture can lead to new points of view concerning the building process. Our concept uses the possibility of free navigation with the help of a conventional web browser. On mouseover of the floor plan or the tracings, individual areas are highlighted in colour. After clicking on these areas, the user is directed to pop up windows with respective detail photographs and written information (for example, descriptions of the object). The user can thus make a decision as to which areas of the architectural sculpture he or she would like to examine and compare. The web page is the result of a project at the "Kunstgeschichtliches Seminar der Humboldt-Universität zu Berlin". Under the title "Visualisation of romanesque architectural sculpture - localisation in an architectural context" students of art history compiled a multimedia-based web tool that enables the user to locate and visualise architectural sculpture (such as reliefs or capitals) in their architectural context, for example on portals or columns. Art historians who are interested in the exact position of a certain architectural sculpture often face the problem of previous analysis conducted without consideration of the architectural context, not to mention the fact that specific information about the position is scarcly mentioned in the research literature. Particularly for complex buildings with a broad range of details, one can lose the overview. Two-dimensional reference systems that are common and widespread in scientific literature prove to be less user-friendly in such cases. Furthermore, they are neither combinable nor expandable. Considering these important needs in researching architectural sculpture, a computer based environment offers excellent assistance. The sculpture can be displayed in its architectural surrounding with adequate additional information by means of accompanying images.